A fragrant mounding thyme, Lime Thyme makes a great ground cover. The bright green lime-colored leaves are scented of citrus and help brighten up darker corners of the garden. 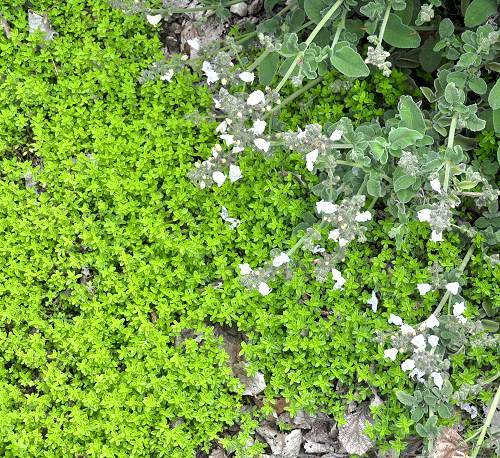 In the photo above, Lime Thyme fills in under the white flowers of gray leaved Greek Sage. It blooms in the summer which is later than most thymes. Even though the fragrance is heavenly, this herb is more ornamental than culinary and does not have a citrus taste and does not make an adequate culinary herb. For cooking, use Lemon Thyme, a tall prolific grower full of citrus flavor. This plant is often available in plug trays. These trays hold 128 of all the same plant. They are a great low cost way to fill a lot of space. Each cell is 3/4 of inch by an inch. 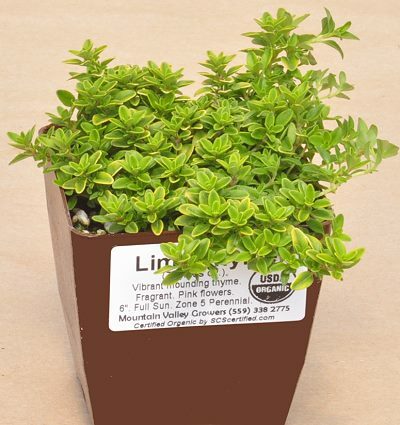 Check here to see if Lime Thyme Plug Trays are available.